Meet the mobile CRM that works wherever you work. Move relationships forward while you’re on the move. Did you know 24% more sales reps hit their annual sales quota when they work at sales organisations that support a mobile work environment? Copper’s mobile CRM makes it easy to manage relationships and close deals right from your phone. 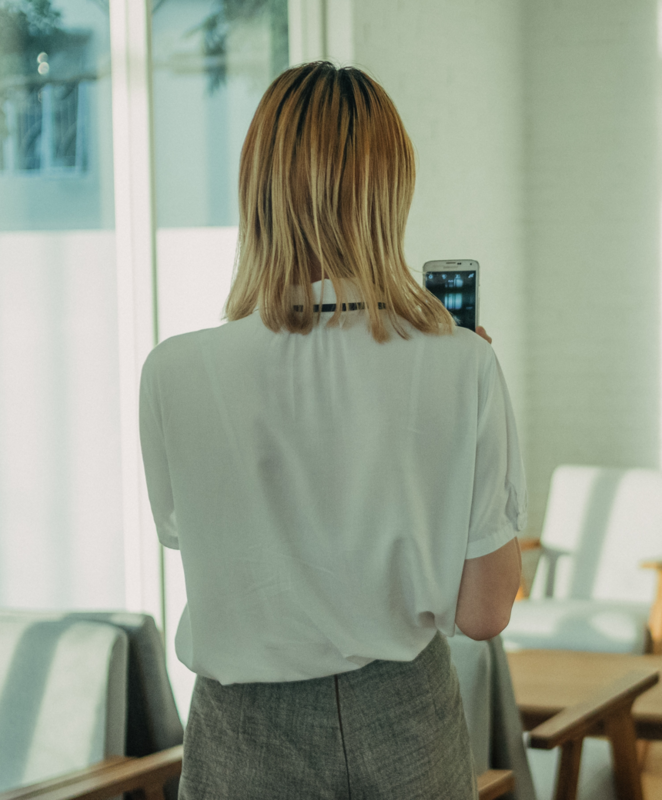 From answering customers to approving last-minute proposals and tracking your sales pipeline, relationship-building won’t stop when you’re away from your desk. Manage your entire day from the palm of your hand. Copper’s CRM mobile app keeps you organised and helps you stay on top of new leads and current opportunities that need nurturing while you’re on the road. Check the status of a deal waiting for the bus on your way home, @mention your teammate to let them know coffee went well after a first meeting, and add that new contact you met at a conference with notes and next steps while they’re fresh in your mind. Track your deal pipeline from anywhere. With Copper’s mobile sales pipeline software, you can visualise the health of your entire sales pipeline right from the palm of your hand. 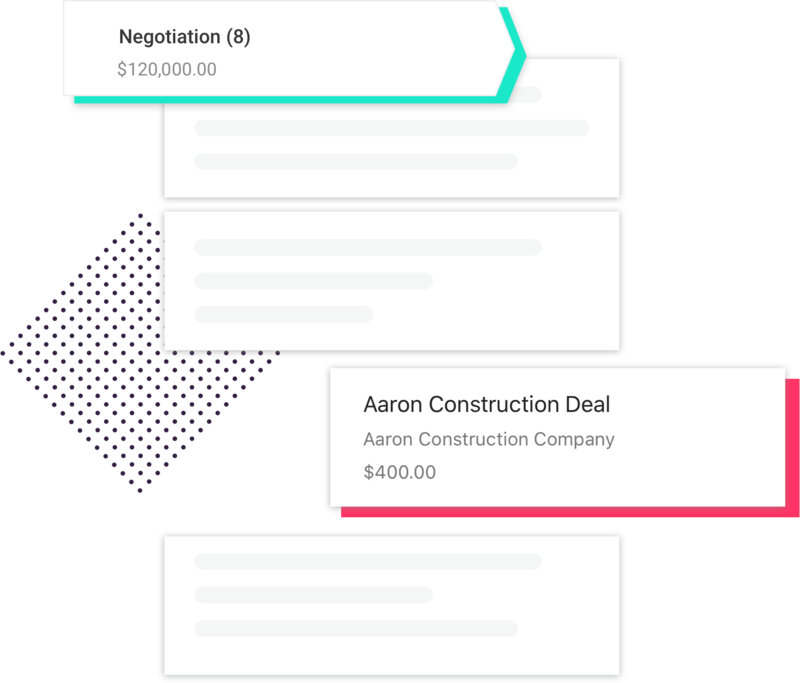 Easily sort, filter, and view activity and track details and changes in real time so you can stay on top of deals and instantly spot when others go off track. Never let leads slip through the cracks. Already have a Copper account? Get the app now! Our sales reps use the Copper mobile app to enter customer information while they are out in the field. The app helps keep everyone on the same page! Make every seller more productive on the road. Copper’s mobile app gives you access to important lead, deal, and customer data from anywhere. 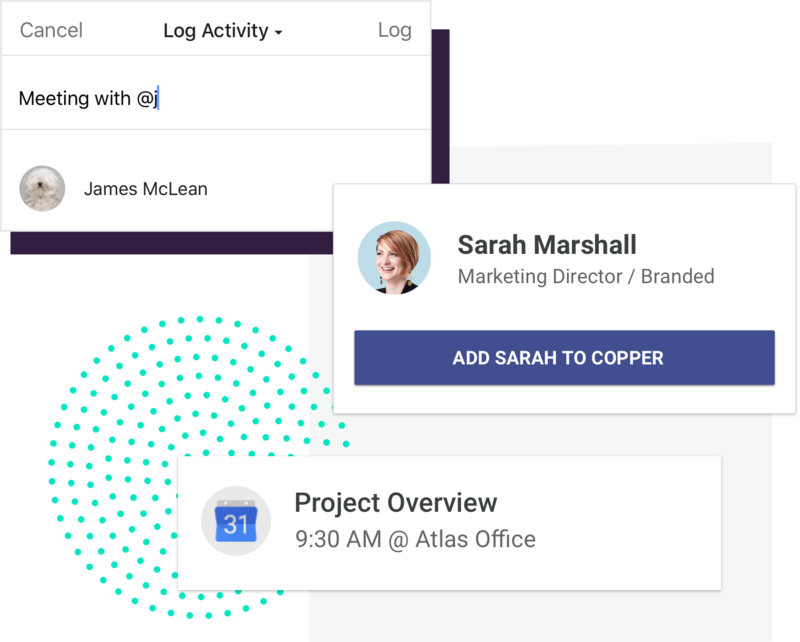 Log notes, add contacts, collaborate with your team, and more, all on the go. 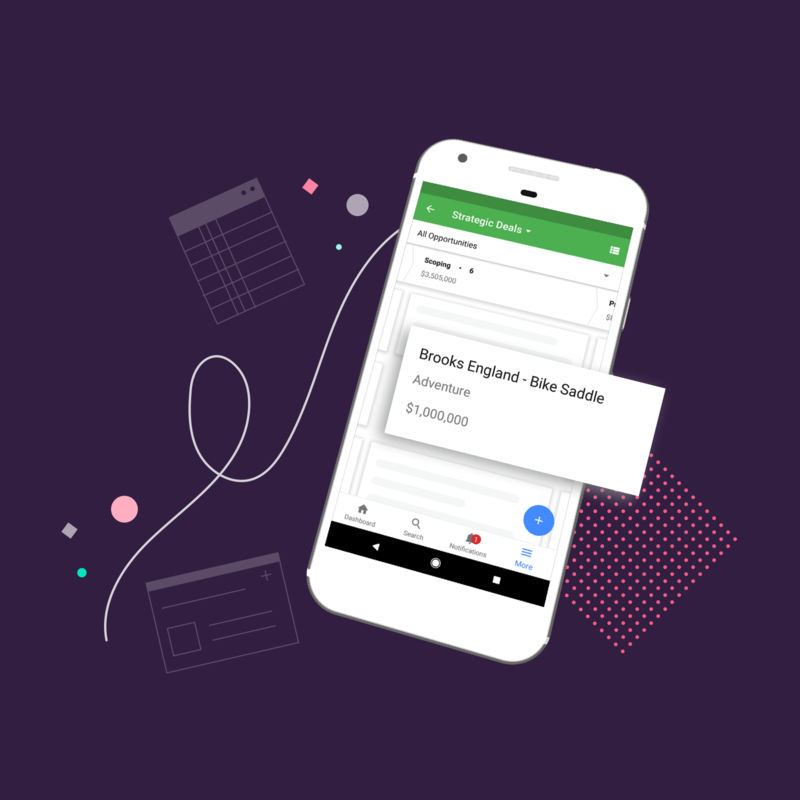 Keep relationships moving forward and make collaboration between your team on the road and at the office easier with real-time notifications and access to all your contact data. When you don’t have to wait until you’re back at your desk to log notes (or add contacts, or notify teammates on next steps, or update your pipeline — you get the idea), nothing slips through the cracks. Copper provides a full, robust CRM tool in the palm of your hand. The app is designed to mirror the experience on web, giving you maximum functionality with no extra training needed. 12,000 customers that love Copper. Copper customers get more done on the move. What makes Copper the best mobile crm? Track, sort, filter, and view activity in real time. See the health of your entire pipeline and move opportunities forward in a clear, easy-to-understand view. Get to know your audience and build long-lasting relationships by engaging and nurturing leads anywhere work takes you. Track and manage calls, emails, meetings, and follow-ups on deals, wherever you are. Build sales pipelines and win new business on the road. With Copper, you can manage new leads and opportunities through a qualification process—right in the app. When viewing a contact, you’ve got one-tap access front and center to call, text, and email that person. You can even get instant directions to their business! Schedule and manage your sales meetings right from Copper. The mobile app dashboard gives you a daily summary of all the meetings you have for the day. The mobile app is available in English (en), Spanish (es), French (fr), German (de), and Dutch (nl) so international teams can now work in sync using the same tool. Real-time alerts sent straight to your mobile phone, iPad, or tablet deliver updated information, letting you know when leads and deals need attention. 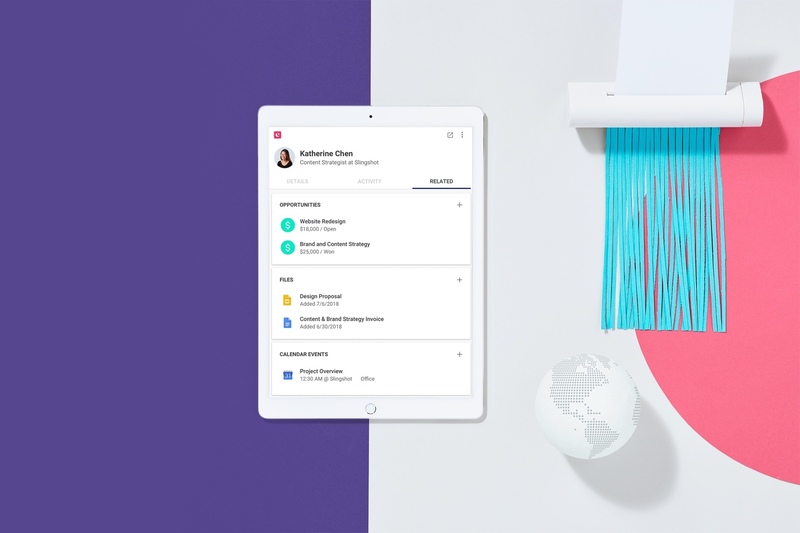 Instantly find and access the exact type of activity you’re looking for using filters whether that’s an email, note, task, meeting, or file. Access and update Copper from your iPad and tablet with an experience that looks and feels just like the web and mobile experience. Log activities and notes by speaking into your phone—no typing needed. Send and reply to emails without ever leaving the Copper app. No more switching back and forth between the Gmail app and CRM again. 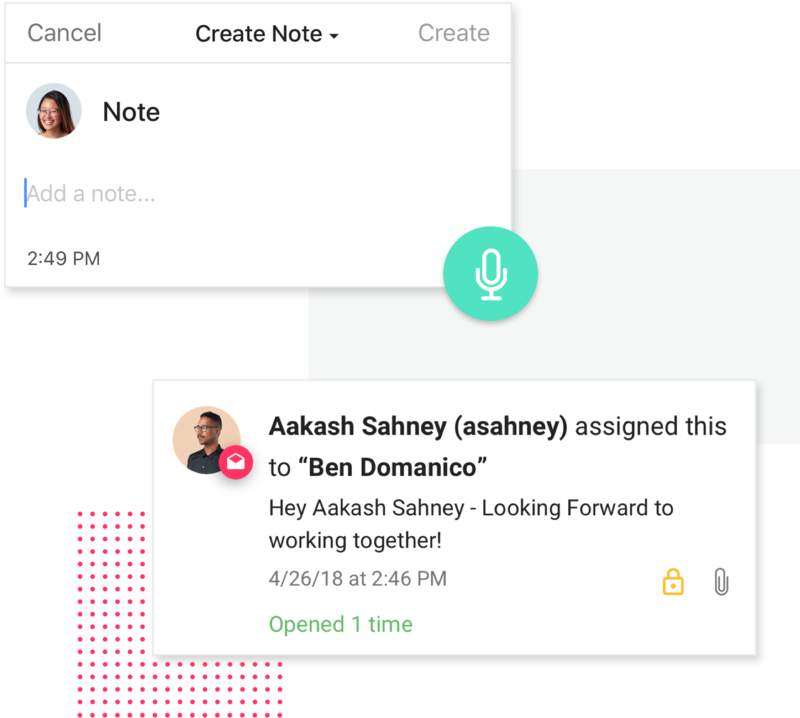 @mentions help keep the ball rolling between remote teams and teams in the office with real-time notifications. Know exactly when contacts open your email messages so you can reach out while you’re top of mind. Build customisations and train your relationship team in minutes. The mobile app is built to mirror the web experience, so adoption will be easy. the mobile CRM that works wherever you work.